After two or three years of soil improvement, Sepp Holzer is ready to start his (nearly) do-nothing orchards. 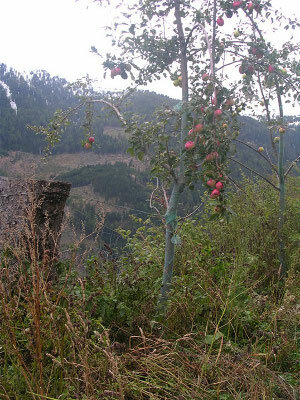 With over a hundred acres of farmland holding around 14,000 individual fruit trees, Holzer clearly can't feed, prune, and manicure every inch of his fruit plantation. Instead, he goes to the opposite extreme, selecting for extremely hardy plants that can survive when planted into plain soil and never pruned. In fact, Holzer doesn't even harvest most of his fruits. 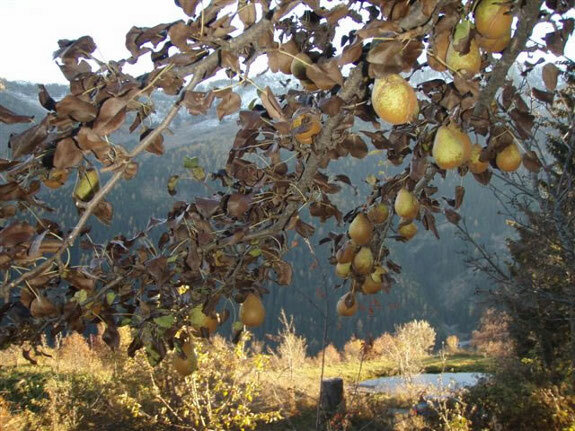 He sells many of his heirloom pears to distillery owners who come and harvest the fruits themselves, and most of the rest of the bounty falls to the ground and feeds his livestock over the winter. Holzer's first step when expanding his orchard is to send pigs through to loosen the soil and trample down the green manure plants. Next, he spreads pomace that has fermented for about a month across the ground. (Pomace is the skins and seeds left after making wine, oil, or --- in this case --- cider.) The apple and pear seeds sprout and either grow or die, with the seedlings best suited to the particular spot they've been placed outcompeting the others. These seedlings will become vigorous rootstocks, producing trees that grow taller and fruit later than those on commercial rootstock, but also tend to live longer. 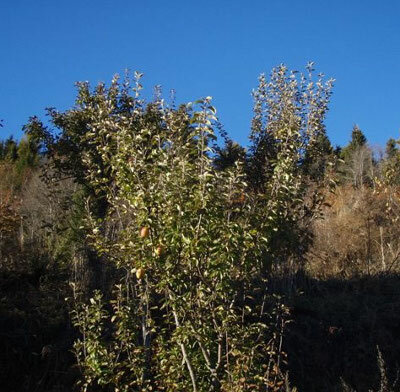 A year or two after spreading the pomace, Holzer comes through to transplant out trees that are too close together --- these are grafted in his nursery and sold as one of his sources of income. The best seedlings are left in place and have heirloom apple and pear scionwood grafted on. Holzer doesn't prune at all, not even to remove the watersprouts that pop up from the rootstock (and which he believes protect the main trunk from nibbling wildlife.) Rather than fertilizing the trees, he simply sends his livestock through the area at intervals, meanwhile allowing the green manure plants to continue to improve the soil around the trees' roots. While I don't recommend Holzer's do-nothing fruit production for the backyard hobbyist with only a small growing area, his methods work very well for large expanses of pasture. As you'll see in tomorrow's post, the fruit trees provide so much food for his livestock that he barely has to feed them at all. My 99 cent ebook shows you how, when, and what to plant in your spring garden. This makes my heart flutter with excitement. I am a farming nerd. I absolutely love the idea of animals gleaning most of their own food. I know exactly what you mean! I guess I'm a farming nerd too. Does he have a blog or a website? Reddcin --- His website is http://www.krameterhof.at/. If you click on the British flag, you'll get an English version, but the latter isn't as complete. I perused the non-English (Austrian?) side to find his photo albums and used Google translator to translate bits and pieces. His website is in standard German. Which is a good thing, I suppose. I don't think Google translate would know how to handle the local Bavarian dialect. It shows in his given name; Sepp is a common Bavarian nickname for Josef. Toland --- I was hoping you would weigh in. I thought maybe they spoke German in Austria, but I know so little about Europe... I used the feature on Google translate where you let it guess what language you're using. Which names are you interested in? Maybe I can help. I most wanted to know what the two roots were that I posted about yesterday, but when I followed the link and translated that heading today, it just vaguely talked about "two roots." Oh well! Thanks for offering, though --- I'll keep that in mind the next time I peruse his site and get stuck. The caption of the picture says "Enzianwurzeln" (hint; in German, nouns start with a capital letter). Since I know that "wurzel" meens root. I looked up "Enzian" on the German wikipedia. Articles about plants on Wikipedia all have the proper scientific name ("Wissenschaftlicher Name" in German) on them. It is Gentiana, which is gentian in English. Not that difficult. It seems that in Austria, roots of the yellow gentian (gentiana lutea) are used in making a schnapps (liquor) which is also called Enzian. Awesome! I did notice in this book that he sells a lot of his pears to be made into schnapps, and he does talk about gentians, but I thought they were just for flowers. Thanks for deciphering that! The roots of the yellow gentian are quite bitter. This bitterness is still recognizable in a 1:200000 solution in water of the active ingredient amarogentin (also found in swertia chirata). Maybe a solution drawn from those roots could form a natural deterrant for deer when sprayed over/around your vegetables? We've had no luck with taste based deer deterrents. You have to add them to your garden after every rain, and it rains here a lot. With the size of our garden, we'd probably spend several hours a week spraying deterrents on if we went that route.